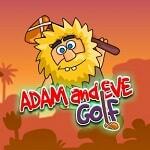 The game Adam and Eve: Golf is made in cartoon style with a simulation of golf. As in standard golf, the main goal is to roll the mice into the hole. Use the right strike force and choose the flight path to collect all the golden stars along the way and finish the level for the minimum number of strokes.